A screening series of contemporary moving image that mediates the precarious boundaries between public space and personal psyche. Ranging from the meditative and transcendent to the cacophonous and debaucherous, these layered realities attempt to reclaim timeworn ideologies, made manifest via social network dynamics, contested geopolitical histories, formulaic mass entertainment, ecstatic virtual imaginings and oscillating collective projections. This powerful compilation of works challenges the currency and potentiality of events, and points towards alternative aesthetics and modes of existence. The programs presented include short-form, feature-length, single-channel and installation-based works. Experimental Film Society is a group of filmmakers credited with bringing a new energy to Irish experimental cinema. Their uncompromisingly personal work raids their psyches to fuel phantasmagorical reconfigurations of techniques and half-remembered nightmares from cinema history. As they experiment with cinema, they allow it equally to experiment on them, creating richly experiential works that chart an uncomfortable territory that is at once uncannily familiar and utterly alien. In evoking possible futures cinema might once have had, these films upset the continuum, rendering the apparent solidity of our current condition fractious and plastic. Experimental Film Society (EFS) is pleased to announce the publication of Luminous Void: Experimental Film Society Documents, a book chronicling the history of EFS. The book launch will take place at Filmbase, Dublin, and feature a special live performance by Vicky Langan & Maximilian Le Cain. Vicky Langan & Maximilian Le Cain’s longstanding filmmaking partnership has recently expanded to include live performance collaborations. They performed at the 2017 Lausanne Underground Film & Music Festival and at TULCA Festival of Visual Arts where their feature film Inside (2017) premiered. Le Cain makes experimental films that explore a personal relationship with cinema as a site of haunting, while Langan’s practice operates across several overlapping fields. Her vulnerable, emotionally charged work envelops audiences in an aura of dark intimacy. The book was designed, typeset & made into pages in Adobe InDesign by Borna Izadpanah, London. The text was set in typefaces Romain and SangBleu by Swiss Typefaces, Vevey. The book cover was designed by Pouya Ahmadi, Illinois. I am pleased to announce that myself and Dr. Richard Scriven's collaborative project on community and holy wells is being funded by the CreativeIrl & Cork County Council Grant Scheme under the community participation strand of the Creative Ireland Programme 2017-2022. Max Le Cain and I are delighted to announce that we have received a film project award from the Arts Council of Ireland to make our film INSIDE. ‪This will be the first feature-length work in our seven-year film-making collaboration! This film is an Experimental Film Society production. Accompanying text by Sarah Hayden, Lecturer in 20th and 21st Century American Literature and Culture at the University of Southampton. To mark the 60th anniversary of the founding of what has become the EU, 12 Star Gallery is organizing a season of exhibitions that features students from Europe’s leading art schools. 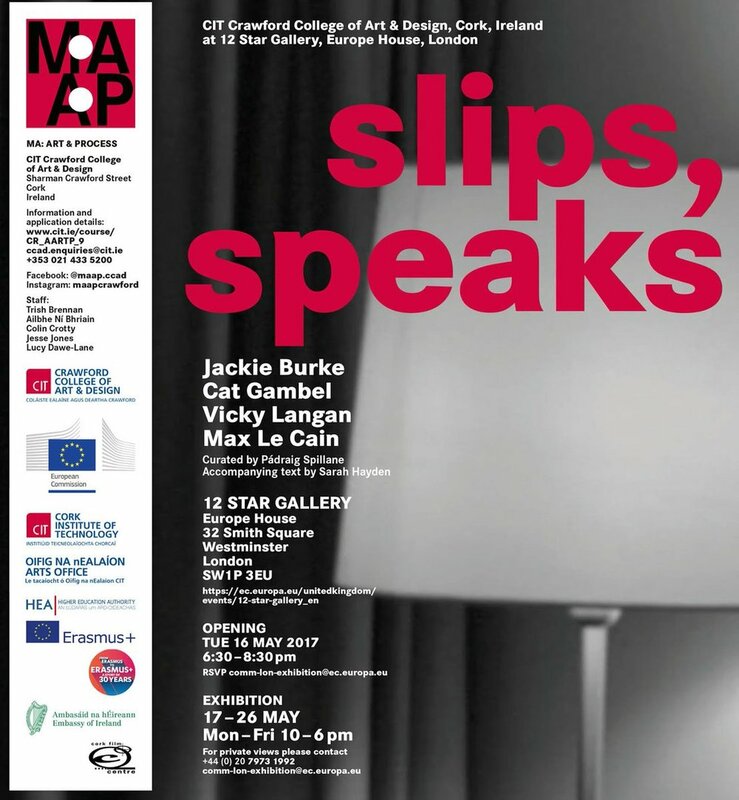 slips, speaks features four 2017 graduates from the MA in Art & Process at CIT Crawford College of Art and Design in Cork, Ireland. This exhibition explores shifting influences within our contemporary times. It contemplates our present flux with works by Jackie Burke, which give back to us digitally disseminated and mass-consumed images of power, through paint on board. In searching from the present to the past, Cat Gambel’s clay and photographic works interrogate how to represent forgotten individuals from family archives. These works do not provoke reaction but reflection. They want us to take notice of what is hidden in plain sight and for examination to bring understanding and reconciliation. Vicky Langan and Max Le Cain, working singularly and collaboratively, seek to bring our attention to the passing moments within in our lives. Langan ask us to listen to the sounds of a roof being taken down to be reconstructed, to immerse ourselves in an intimate reorientating of place. Le Cain, with both moving image and stills, creates ambiguous filmic moments disclosing alternatives that reside in every moment. In this respect, the works presented in slips, speaks look beyond the binaries we are fed by seeking ways to connect with others and to ground ourselves beyond the obvious. Pádraig Spillane is an artist and exhibition-maker based in Cork, Ireland. His work has been exhibited in Kerlin Gallery, Dublin; Treignac Projet, France; and CCA Derry-Londonderry, Northern Ireland. He has curated exhibitions featuring Viviane Sassen, Dara McGrath, Tom Climent, Miriam O’Connor, Zhang Kechun, and Mariela Sancari. Spillane is a 2012 graduate from the MA in Art & Process at CIT Crawford College of Art & Design. CIT Crawford College of Art & Design (CCAD) is a vibrant multi-campus College, which has been providing education in the arts for over 200 years. Crawford graduates are among Ireland’s top artists, designers, media designers and communicators, art therapists and art educationalists. audiograft returns with its annual mix of new experimental music and sound, exhibitions, artists talks and workshops. This year’s festival promises to open your ears and eyes to extraordinary and surprising sounds and events, with voices emerging as if from nowhere, rotating sounds, kinetic sculpture for used computer cases, intimate physical theatre, and consumer electronics pushed to their limits. At the heart of the festival is a group exhibition at OVADA featuring Stephen Cornford, Yann Leguay & Gaetan Rusquet and Harriet Butler. The festival also features The International Nothing, described as Berlin’s finest in Clarinet entertainment. Artist Dialogues are a curated series of discussions, featuring artists Thor McIntyre-Burnie, Vicky Langan, Yann Leguay and Stephen Cornford from this year’s festival programme. We’ll be looking upon kinetic sculpture to composition, improvisation to spatial intervention and materialism and beyond, picking between the nuances in what is explored and discovered. These dialogues take the form of a discussion and serve as an informal way for those interested in different aspects of the festival to listen to the artists open up, discuss their work and share thoughts on how and what they are making. Vicky will show and discuss her work in RHB 155, which is located on the ground floor of the Richard Hoggart Building in Goldsmiths, in the Electronic Music Studios. This event is run by the Fringe and Underground Music Group.